My husband occasionally travels for his job and on Monday he had to go to Wisconsin, so Finn and I tagged along. Oh. my. goodness. the colors of the changing leaves driving there and back was absolutely gorgeous. 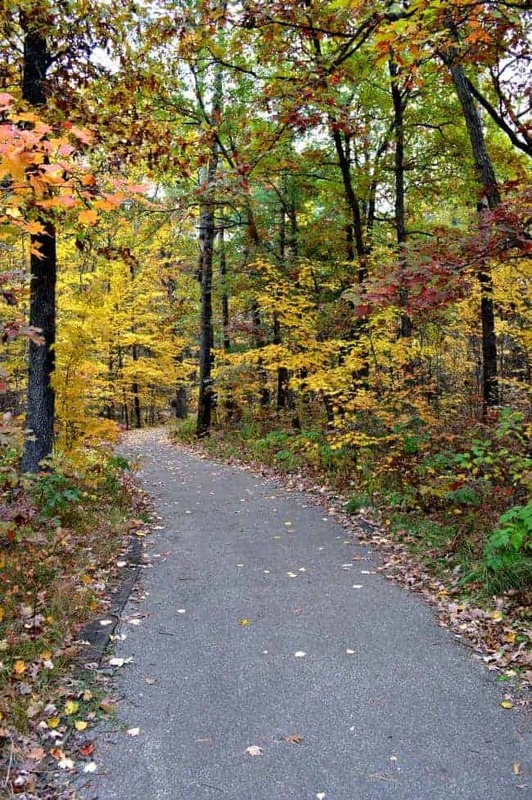 We stopped several times to take pictures and we even strolled along this beautiful winding path at a rest area. Back at our house, we have been spending as much time as we can outside doing some last-minute chores and getting our yard ready for the next season, that I don’t want to talk about 😉 and I wanted to share our progress. 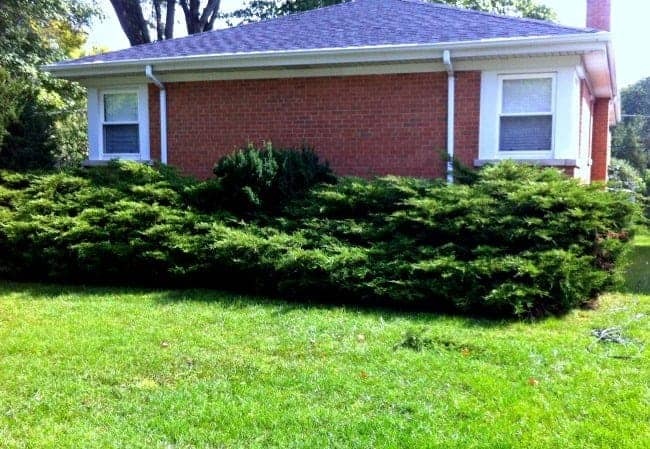 We had these huge 60-year-old juniper bushes on the side and front of the house. There is no easy way to pull them out so Mr. C² had to cut the branches off, then cut up the thick stumps. After they were out he had to tie the branches up into bundles for the yard waste service. It was a huge and difficult job, and it’s taken him about a year to get them all out, but I’m happy to say there are no more junipers! We left one evergreen standing, for now, because it helps shield the master bedroom window just a bit. 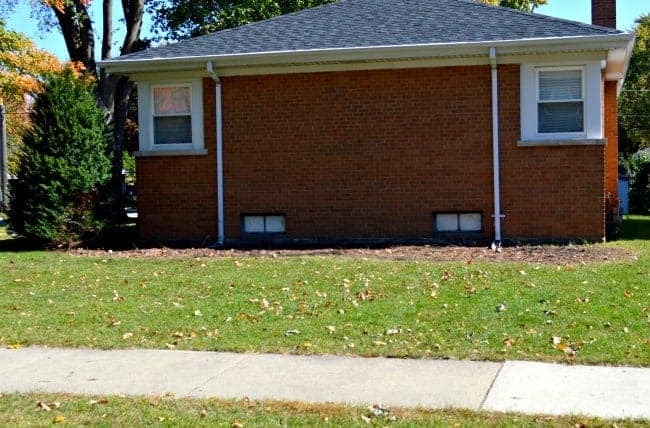 All we need to do now is to clean up the beds, cover the basement windows with my DIY shutters, and next Spring I’ll start planting. We’ve also been cleaning up our vegetable garden. 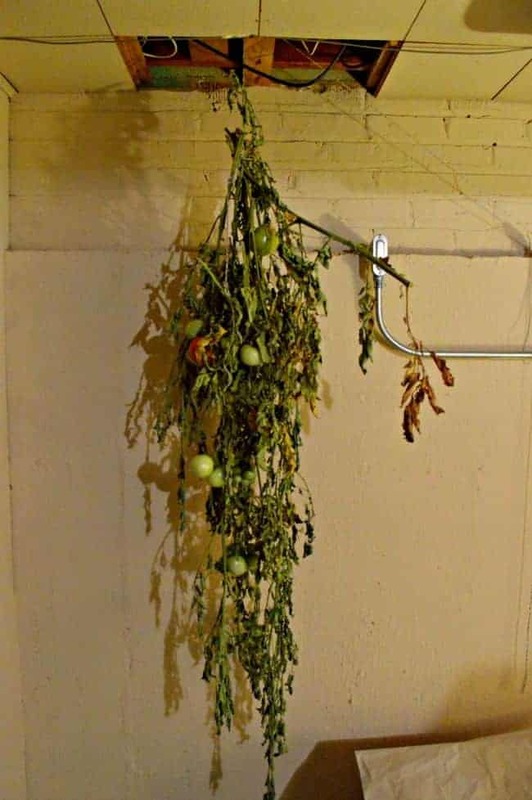 We only had tomatoes left and instead of yanking out all of the plants and composting them, we decided to take one of the plants, that still had quite a few green tomatoes, and hang it in the basement (upside down). I read somewhere online that it was a good way to get green tomatoes to ripen once the weather turned too cool for the plants to do well. Here is the plant 3 days after we hung it in our basement. See all the green tomatoes? This is after 3 weeks with no water and no care. Lots of red tomatoes! We also put some that we picked into a cardboard box, in a single layer. I’ll let you know how our experiment goes and what they taste like. I’m not holding out much hope for tasty tomatoes, but you never know. Are you getting your house ready for winter? Did you have a garden this year? What did you do with your green tomatoes? Hi Kristi, Next year I will have to try the upside down tomatoes. It seems funny that they would ripen with no water or soil, but I guess it’s the same as just picking them and letting them ripen on the counter. Although I have had them rot doing it that way. We have had some incredibly warm weather this past week. My impatiens are still in full color and they seem a little strange next to the mums so I put the pots with the impatiens on the back patio and my mums with a bale of hay my son dropped off and pumpkins on the front “porch”. I took a pic with my grandson on the front stoop and with some of the fallen leaves and my fall decor he looked so cute! Patio furniture has been put away and all plants except for the impatiens have been pulled. Nothing left accept my rocker in front, which is holding a pumpkin right now, to put away for the winter. Yuck! “Winter”, don’t want to think about it yet! I think you’re right about the tomatoes MJ. I wasn’t sure they would ripen like they did. It sounds like you are having some great weather. We have been in the 50’s for a few weeks now and it’s been raining nonstop this week. We still have so much to do outside before you know what comes. I don’t want to think about it either. Thanks so much for stopping by. It’s always great to hear what you’re up to. P.S. Did you get your tub painted? I am very intrigued by your tomatoes. Surely mine will ripen up, too, so I’m yanking mine. 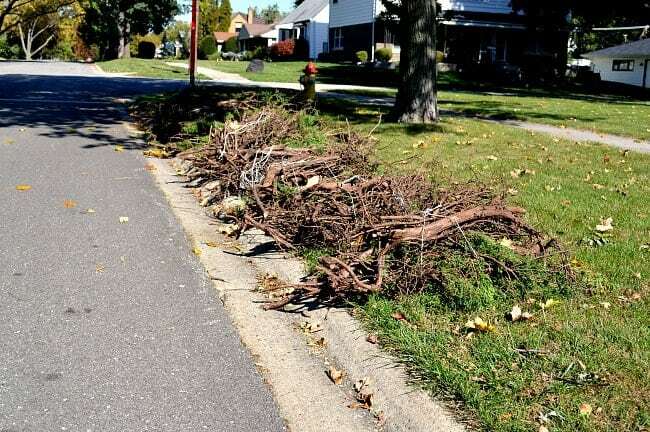 It’s always sad to pull out ancient bushes, but they have lived their useful lives and it’s time to move on. I’m looking forward to seeing what you do with that new bed! I’ve never heard of hanging them upside down until a few months ago, so I’m anxious to see what happens. Thanks so much for stopping by Jenny, and for commenting. My hubby has some family on the North Shore in MN – they have been posting photos on FB of the gorgeous fall colors back there! I, too, have been getting things ready for winter. I use chopped up leaves as mulch on my empty raised beds after pulling out the spent plants. The dahlias are still going strong, however. We’ll see how they do during the forecasted rainy spell. Glad you were able to get all those junipers removed, OY! I’ve lived in the South for 20 years so it’s been quite a while since I saw foliage like that. So, so pretty. What a great way to use chopped up leaves. I’ll have to talk to my husband about doing that. I’m so glad the junipers are all out too. 🙂 We have talked about removing them since the day we first looked at the house. Now I’ll have to figure out what to plant. Thanks much for stopping by and for sharing your leaf tip. 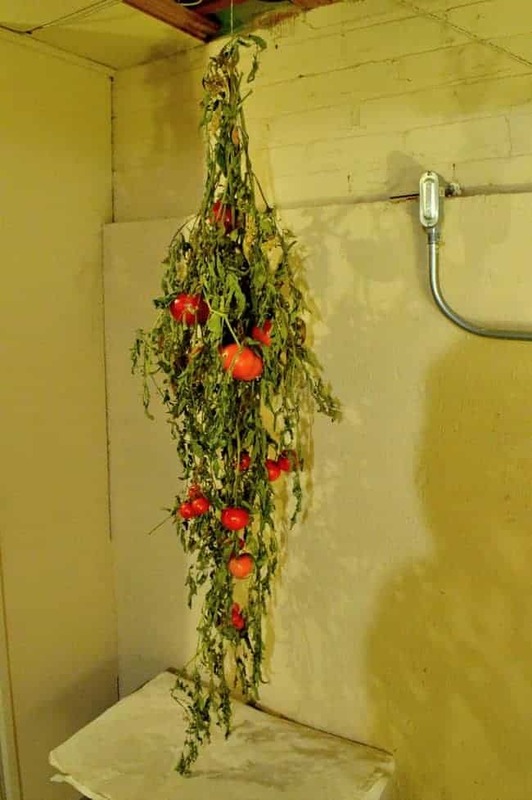 I ever heard of hanging tomatoes to ripen. Of course we do not have cool basements in Florida to do that. Could be why. I have wrapped green tomatoes in newspaper and placed in a cardboard box when we moved mid season once and they ripened. Didn’t taste to bad either. In the South we fry our green tomatoes. Yum. I’ve never heard of it either Deborah. We’ll see if it works. I never heard of the newspaper trick…I’ll have to keep that in mind. We lived in Macon, GA for 11 years and had fried green tomatoes all the time. Yum. You don’t find them in Illinois. Getting out overgrown bushes is not a fun job. Good luck on getting yours out. Thanks for stopping by and commenting today. It’s great to hear from you.